Roman Kogler (Thomas Schubert) is 19 years old and has lived all his life in institutions. Abandoned by his mother as a young child and raised in an orphanage, he is now serving time in a juvenile detention centre having accidentally killed a boy of his own age in a brawl. A solitary boy with an uncommunicative attitude, he has no friends, family or connections to turn to in the outside world. But when threatened with a life behind bars unless he finds a job and sticks to it, he eventually finds a probation job shifting dead bodies at the municipal morgue in Vienna. The work is physically and emotionally draining and his co-workers are not exactly welcoming. But when Roman is one day faced with a dead woman who bears his family name, it occurs to him that this may be the mother who gave him up for adoption and he begins to explore his past. Described by The Guardian as "Tremendously impressive," The Evening Standard as "Excellent" and Sight & Sound as "A beautiful piece of filmmaking," Breathing (Atmen) was awarded the Label Europa Cinemas award for best European Film in Director's Fortnight at the Cannes Film Festival, and went on to win Best Film at the Sarajevo Film Festival. The film is the directorial debut of Austrian actor Karl Markovics (The Counterfeiters). 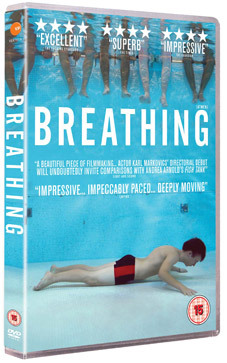 Breathing will be released on UK DVD and Blu-ray on 10th September 2012 by Verve Pictures. No extras have been detailed as yet. This is happening a lot recently.